We are all about the cold, but good things come to those who SWEAT. And you will sweat with infrared technology of The Shape Pod at Chill + Heal Cryotherapy Spa! Detoxify, reduce stress, and improve your wellbeing. We’ve had a great time this week playing with our new treatment and now it’s time to offer it to YOU. CLICK HERE FOR SPECIAL INTRODUCTORY PRICING! While supplies last! What is The Shape Pod? The Shape Pod is the ultimate compliment for all fitness levels and weight management programs. Manage weight, slim, firm, and tone your body! Workout benefits are increased with this high heat technology. So how does The Shape Pod work? The deep heat and vibration helps burn more calories, and the ultra-relaxing massage will help with post-workout recovery. It’s fast and effective and a great addition to our other line of treatments. You can also choose to use the resistance bands and do a HIIT workout while enjoying your session. Discover soothing total body dual heat and vibration massage for ultimate relaxation. Using infrared heat technology to burn calories, infrared saunas are clinically shown to aid weight loss. During a sauna weight loss session, core temperatures increase. The body has to work hard to cool itself. Using an infrared sauna increases heart rate, cardiac output and metabolic rate, burning more calories, leading to more weight loss. Perspiration also deeply cleanses the skin by creating beautiful improved tone, texture, and color. Sauna time may also help reduce the appearance of that nasty c-word—cellulite—under the skin by promoting blood circulation and sweating. Infrared rays make you sweat up to 7 times more toxins than traditional saunas. What programs are involved with The Shape Pod? 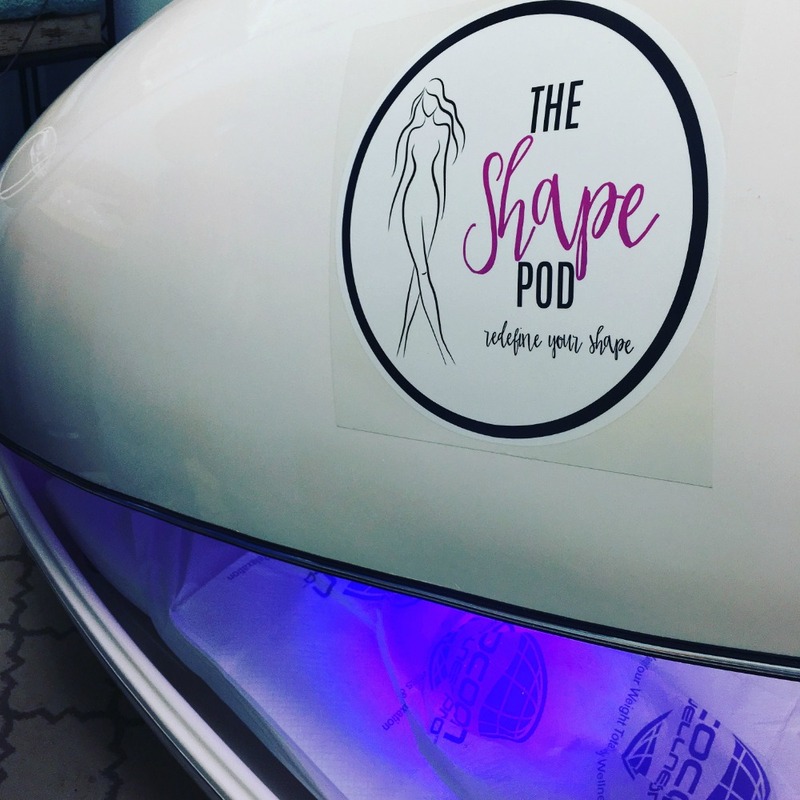 There are several programs you can choose from when using The Shape Pod. How do I prepare for The Shape Pod? You will want to remove your shoes and adjust your attire accordingly. Select the program you wish to experience and get started! You can stop the session at any time if you feel uncomfortable. It is recommended that you hydrate with 8oz of water before and 8 oz of water after each treatment. Can anyone experience The Shape Pod? There are a few contraindications that you want to be aware of before starting this treatment. It is not recommended if you are pregnant, have active cancer, have a pacemaker, diabetes, in poor health, are intoxicated, sensitive to heat, have cardiovascular disease, or have high blood pressure. We recommend that you always consult your physician before trying any new treatment if you have any questions or concerns. It is generally recommended that you start with lower temperatures and light intensity dual massage. The more you experience The Shape Pod, the better you will understand which settings you will ultimately prefer. What else does The Shape Pod have to offer? The vibration and dual heat helps with relaxation and relieves tension. There is also a Himalayan Salt breeze, and the treatment will help reduce stress and offer better sleep. The head and bed are cushioned and comfy and ready for enjoyment. There is also an essential oil component that you can enjoy while experiencing your treatments. What is the Pricing of The Shape Pod Pro? CLICK HERE FOR OUR SPECIAL INTRO PRICING OPTION!! !